How To Choose The Correct Formula Milk For Baby - There are times where breast milk is not recommended for the baby. This usually happens if the baby or mother has health problems. Therefore the final step so that the baby is not malnourished it is advisable to provide formula milk as a substitute for breast milk. Then what to consider when choosing the best additional intake is best considering the amount of formula milk products sold in the market? It is not easy to choose formula for newborns or under the age of one year. Because, babies at this age should not get any intake, as well as formula milk because babies still can't digest food properly. Therefore the most important thing to note when choosing a formula is to check its content, not brand or price. Basically, all formula products consist of a collection of key nutrients, namely proteins, carbohydrates, vitamin fats, and minerals. Make sure in the packaging of milk there is a writing that this product is suitable for the consumption of newborns. For newborns and still under the age of one year, you should select formula milk products derived from cow's milk. The next step is to pay attention to the type of protein used. Cow's milk protein is divided into two, namely whey and casein. Type of whey is more recommended for newborns because it is considered easier to digest. However, it is better to replace breast milk with formula we have to consult with a doctor. In the market. there is a formula milk derived from soybeans. Manufacturers say soy formula is for infants who are allergic to cow's milk. However, should avoid soy-based milk if your baby is normal or allergic to cow's milk, except with a doctor's permission. Because in general, infants who are allergic to cow's milk will be allergic to soy milk. In addition, health experts do not recommend soy milk for infants under the age of 6 months because soy milk has a glucose content that can damage baby's teeth. If your baby is allergic to cow's milk, consult your doctor. She may suggest formula with special formulations. this type of milk is still based on cow's milk, but the protein content has been processed so it is easy to digest. In addition to soy formula, there are several types of milk that should be avoided, such as regular cow's milk, cereal milk, sweetened condensed milk, goat milk, evaporated milk, and almond milk. Some babies may refuse when given formula because she is used to breast milk. 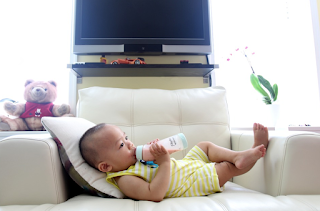 To get a baby to drink formula, we can mix it with breast milk gradual. We can also drip on the pacifier or warm the baby's pacifier before use. Usually, babies do not want if the bottle is given by his mother because if the baby is close to his mother in the hope to give breast milk. We can ask our partner's help to be able to feed bottles to the baby so that he gets used to formula milk. Giving formula milk is an alternative way, but if we can give breast milk exclusively then give milk to your baby.